With air traffic predicted to grow at an average rate of 8% per year, and in some areas even up to 20%, the amount of air cargo flown around will also increase tremendously. As a result, companies involved with air cargo face growing challenges on how to organise this and how to get cargo from and to their customers safely and on time. For this, our company SACO, backed by more than 50 years of experience, offers ULD handling solutions ranging from basic systems for manual manoeuvring to fully mechanised and automated systems. 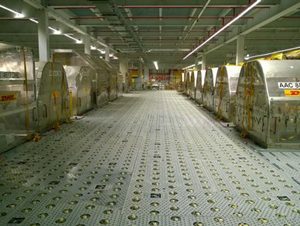 Based in The Netherlands, SACO designs, manufactures and supplies turnkey cargo handling equipment and systems based on standard conveyor decks, truck docks, dolly docks, workstations, scissor lifts, weighing stations, storage systems incorporating (elevating) transfer vehicles ((E)TVs) and the required control and management IT systems. With our Slave Pallet system additional flexibility is given to the handling operation. SACO’s systems have been successfully supplied and commissioned in USA, Canada and most European countries, but also in India, Indonesia, Bangladesh, Russia, UAE, New Zealand, Greenland, Curaçao, Ghana, Rwanda and Ethiopia.